High on a hill, above the mills and factories of the old wool town of Huddersfield, stands the house that chocolate built. Grand and handsome, it has a solid, York stone carapace, tall chimneys and huge, dark windows that shine like liquorice. Inside, cliffs of mahogany panelling cast shadows on the walls and strange symbols have been etched and stained upon panes of glass. There is no broomstick in the hall, or bubbling cauldron in the eerily cold kitchen, yet it is exactly the kind of house a witch would choose to live in. One hundred years ago, you had to be a mill owner with a toiling workforce to own a house like this, but the current châtelaine, the mysterious author Joanne Harris, bought it with just her imagination and a laptop computer the size of "a toasted sandwich''. After her 1999 novel Chocolat - about a witch who owned a sweetshop - beame a worldwide bestseller and was made into a Hollywood film, Harris became quite spellbindingly rich. She laughs without much mirth and says that rumours of her wealth have been exaggerated, while "no one around here thinks Jeffrey Archer is living in their midst''. Yet there are nearly five acres of land, a new slate roof and an interior filled with curios and stained glass, some of them designed by Harris. Not that she is given to caprice or ostentation. The only touch of designer flash is a powder-blue Smeg fridge in the kitchen, while wiry grey strands glitter proud and untouched among her sooty, black hair. One might have expected swooping rags and a pointed hat, but today she is in mufti: a cheesecloth shirt from Monsoon, Maharishi combat trousers and a pair of scuffed old trainers. A ruby pendant, a gift from her husband, Kevin, lies against her white neck like a drop of blood. This is the smart Joanne, she says. Usually, she is spattered with paint and even scruffier, although her character is unchanging - a tannic brew of Yorkshire stoutness and French hauteur. If Joanne Harris was a cup of tea, you would be able to stand your spoon up in her. "I wouldn't be seen dead eating British black pudding! I only eat black pudding in France. And even then, only for nostalgic reasons,'' is the kind of thing she says. She spent much of her childhood in Normandy, with the French side of her family, and this has led to a deep suspicion of British food. One wonders why she does not simply emigrate, but when she began house-hunting, Harris wanted to buy a home in Barnsley, where she grew up with her French mother and English father, but couldn't find a property big enough. "Then Kevin and I saw this and fell in love with it,'' she says. Their home is set deep in a wood, complete with trees that have their own preservation orders and a pair of gardeners who are burning autumn leaves, causing drifts of smoke to pass in front of the chocolate house and the Victorian greenhouse next to it. When the pall clears, you can see that a black fig tree has grown monstrous inside the greenhouse, its limbs and branches pushing against the glass panes in gnarled agony. The tree produces so many figs that the mistress of the house doesn't know what to do with them all. Harris has made fig jam, no end of fig salads, and big fig tarts topped with goat's cheese. She also serves the figs raw, or with pools of honey and yogurt. In her new cookbook, a glossy tome that focuses on the seasonal produce available in French markets, she has published a simple recipe for figs stuffed with cheese, Bayonne ham and mint, then drizzled with olive oil. Not really a recipe, she says. More of an idea. That is the whole point of the book, apparently. Clues for the clueless. Tips for those who might scream if they see an artichoke. Joanne, you cannot be serious. Smoke billows over the garden. A child with inky hair just like Joanne's dances wildly around the bonfire. It is her 12-year-old daughter, Anouchka. 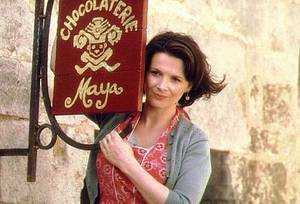 In Chocolat, the main character, Vianne Rocher, and her daughter, Anouk, arrive in a small French village and open a chocolate shop opposite the church at the beginning of Lent, the season of self-denial. Vianne is a sorceress, and the mother/daughter bond in the book is depicted as particularly strong. At home in Yorkshire, Joanne and Anouchka converse in French. Kevin speaks French, too, but he is not quite as fluent as the womenfolk. In Joanne's wood-panelled study, he brings us tea and three packets of chocolate biscuits. They lie unopened between us for the rest of the morning, like a reprimand. Just like her school mistress mother before her, Harris taught French at school - for 15 years - and, despite her eight novels and two cookbooks being published in 40 countries, still thinks of herself as a teacher who sometimes writes books, rather than a successful author. Indeed, a great deal of teacher remains silted within her, like an anchor hooked to her soul. Sit up at the back and pay attention, for the signs are sometimes fleeting. She talks with fluency and authority, does not brook interruption and is unused to having her opinions challenged. Neither doubt nor hesitation ever creeps into her clear, plangent voice. One sits, half expecting a cuff on the back of the head with a blackboard duster. Does she, like me, remember being given corporal punishment at school? Certainly, Harris's manner is still suffused with the kind of intellectual certitude of the brightest girl in class, although she does remember being bullied at primary school, where she was considered to be very strange. After this, she attended college in Barnsley, where she met Kevin, her first and only boyfriend, before going to Cambridge to study modern and medieval languages. After that, it was straight into teaching, like most of the women on her mother's side of the family. And she loved it, was really good at it. Pretty strict, too, I imagine. "People did what I said,'' she says modestly. In an article that she wrote about her teaching days for this newspaper recently, Joanne noted how a fellow teacher used to slyly tell his pupils that she travelled between classrooms on her broomstick. Like the bullying of yesteryear, it did not bother her and, anyway, she really is a kind of witch - a good witch. Not only does Harris, with her dark hair and glittering eyes, look like one, but she has also always been interested in witchcraft and has written a book about a witch, and her Who's Who entry declares that one of her hobbies is "priest-baiting''. "Well,'' she begins, carefully. "I have beliefs, certainly. I don't describe myself as a witch because I don't like labels. I am not polarised. I am not a Wiccan or a high magician, I am unaffiliated. "Do I practise witchcraft in any way? That depends on what you mean by witchcraft. I know I am sounding evasive, but it is a term that has been used in so many completely inaccurate ways, that if I gave you a yes or no answer, it would be a meaningless one. What she does believe in is the power of positive thinking and anything that helps achieve that, be it some kind of ritual or fetishistic gesture or object, has "got to be a good thing''. Certainly, her study is a proper witch's lair, with Diptyque candles guttering on the mantelpiece and a spooky teak root in the bay window, laden with objects such as a bowler hat, a Bakelite telephone and assorted glass bottles. It looks like a giant, orange spider at a car-boot sale. Elsewhere, there is an antique book press that I thought was a torture instrument, a jar of sand from the beach near her grandfather's house in Normandy, a black walking cane with a silver skull top (a gift from her husband) and, hanging on the back of the door, a full set of ceremonial priests robes. The appetite sharpens immeasurably. How deliciously weird. There is so much sensual food imagery in Joanne's novels, that a cookbook seemed inevitable. The first one, published in 2002, was a collection of recipes from the French side of her family, while the new one, The French Market, is, as we have discovered, for English holidaymakers who don't know what to do with a ripe tomato. Well, not quite, but Harris does have a reputation as a food sensualist that one sometimes feels is undeserved. In her new cookbook, her pen drips with the joys of the "dark, sweet meat of partridge and pigeon'', and of how she prefers duck breasts to be seared only, so that "the fat is crisp and sizzling'', but in reality, she is a vegetarian who only eats meat when she absolutely has to and only then when she is in France. Rattling around inside the house with her are a husband and daughter who are militant vegetarians - "Anouchka has never eaten meat'' - and, instead of cooking, Harris likes to eat raw vegetables whenever she can. Dinner last night was cheese, bread, olives and red wine for the adults, with vegetarian cottage pie for her daughter because it had been "a cold day and she was running around''. Breakfast this morning was a bowl of raw peas. Yes, she says, yes, yes, she does actually like chocolate, although she doesn't seem passionate about it, in the piggy-eyed way true chocoholics are. "It depends on my mood. I'm not a chocolate snob, I like some types better than others,'' she shrugs, finally admitting a preference for cherries dipped in chocolate at Christmas. When we talk again about the recipes in her book she says that she wouldn't eat the lamb one herself, but she hopes that you "people'' will enjoy it. Smoke swirls around the dark house in the woods. It is time to say goodbye.